Treating professionally Diabetic Foot problems. The methods and materials used for treatment of diabetic patients are sofisticated in developed countries. Wound management is simple: regular inspection, cleansing, removal of surface debris and protection of the regenerating issue from the environment. ​Guidelines classification: PEDIS: P-Perfusion E-Extent-size D-Depth-tissue loss I-Infection S-Sensation SIMPLE treatment for diabetic foot ulcer: • Callus removal • Honey bandages • Off-loading Debridement Callus Removel with scalpel • Off-loading Felt padding as protection against pressure during walking Bandages and ortheses. 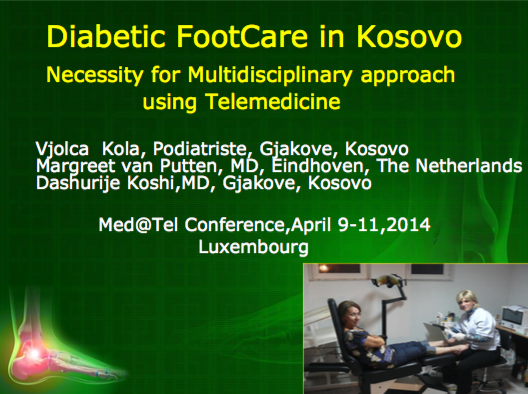 So with those not so expensive methods we achieve a good results in prevention and treating Diabetic Foot problems which are very important for developing countries such as Kosovo.